There is something enchanting about losing yourself in the notes, rhythm and melody of a song which has carved its way into your being and remains there long after the actual music has stopped. The wonderful thing about music is that it is accessible and can be enjoyed by everyone, despite an individual’s personal ability in creating such sounds. 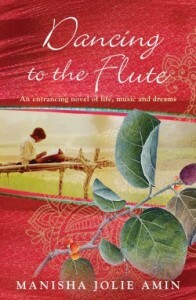 Manisha Jolie Amin’s debut novel Dancing to the Flute is a book which infiltrates like a heartfelt song. Set in India, the novel tells the story of street boy Kalu, who was abandoned on the side of the road as a young child. He remembers nothing of his parents. Kalu is playing a rolled-up leaf like a flute one day and captures the attention of the Vaid. This chance encounter sends Kalu on a musical journey which frees him from his struggle for survival on the street. Amin’s story captures many different facets of India, bringing the desolation, opportunity and possibility of this vast country to life. Amin’s words release from the page like notes in a song, each contributing to the steady, collected melody of the book. Kalu is characterised as a strong, determined, independent boy, who refuses to let go of his independence even as life gives him the opportunity to escape his street existence. It feels as though the wide-eyed protagonist we meet on the first page, deprived of childhood innocence, gradually reclaims some of this innocence as the story progresses and he grows older, in contrast to a coming-of age story where innocence is stripped away on the journey into adulthood. This novel is about Kalu’s journey as a musician, a by-product of which is Kalu growing into a young man, and it feels as though some flicker of innocence is required for him to effectively channel his music. That is not to say his life suddenly becomes sheltered; rather, he gains the love and affection he never received as a child. The characters in this novel are all so vibrant, strong-willed peopled with very different lives, and very different expectations of what life will offer them. Kalu’s close friend, Bal, herds buffalo after being sold by his family into work because they needed the money to support themselves. Malti works as a servant instead of going to school, because she needs to help her family earn enough money so her older brother can gain an education and get a good job. It would be easy to allow a story like this to sink into despair, yet Amin keeps an upbeat tone throughout. Despite their hardships, and despite what life throws at them, the characters in this novel always manage to find something positive to cling to. This isn’t a novel which will make you question why your own life is so fortunate compared to what others have, but rather marvel in the way people with seemingly nothing are able to accept their fortune and get on with it, without complaint. Even so, to me, the novel felt inconsistent in parts. Amin uses foreshadowing to hint at what is to come, yet the foreshadowing feels misdirected as to what actually eventuates. This works in some novels as a twist, yet in this novel I was more confused than impressed by the sudden turn of events. There was one event in particular which was so out of left field I had to stop and read it twice to make sure I hadn’t simply invented words on the page. The event works in the context of the novel, but the way it eventuated felt very strange indeed. Dancing to the Flute is a wonderful read, something which makes you believe in the power of music and the resilience of humankind. I became totally immersed in Kalu’s story, and, while I usually don’t wish a book could continue further than the final page (the end is the end, after all) I desperately wanted to keep reading after the last page and discover how the rest of Kalu’s life pans out, as well as those of his friends. The music described in the novel leaps off the page, taking hold of the reader. Amin’s debut novel is a wonderful representation of what it means to live, and that life is a different journey for everyone. Dear Raelke, Thank you for your review – it’s both generous and humbling to have someone reflect on the things that I wanted to say through this novel. I’ve also read your other piece re the Miles Franklin and it’s definitely got me thinking… I’ll wrote a response to that soon. I went to the launch of a multicultural event today… and you have me thinking about what it means to be Australian and what constitutes Australian writing too! I’ll let you know when I do. Again thank you for your thoughtful review. This entry was posted in Books and tagged lip lit, manisha jolie amin. Bookmark the permalink.